Polymerics recently installed a newly rebuilt No. 9 drop door mixing machine. 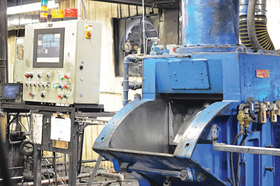 CUYAHOGA FALLS, Ohio—While the giants in the industry keep growing, one small custom mixer is content to stay true to its roots. Officials at Polymerics Inc., which has been in the Sample family since it opened in 1972, say the company's size and pedigree, as well as its ability to work directly with customers, continue to be its recipe for success. “A lot of the times when we're out in the field, we hear customers tell us they appreciate that we still are a privately owned company,” said Sales Manager Timmy Samples, who represents the third generation of his family to work in the business. His father, Tim, became CEO of the company in 2011, while his grandfather, Charles, founded the operation. As some of the smaller mixers disappear—Hexpol A.B. has made several acquisitions over the past few years, including Kardoes Rubber Co. and Portage Precision Polymers Inc.—the younger Samples said customers tell him they are “relieved” that Polymerics continues to be family-owned. “That sets us apart,” he said. Once that handshake has been made, executives say the real work begins. As a result, the elder Samples said the company has become more successful, with sales not only increasing 5 to 10 percent each of the last few years, but it also has become more diversified. While automotive continues to be important, Samples said his company has increased its business in other sectors including agriculture, oil and gas, new construction, and coated fabrics. Polymerics has invested $1.2 million to improve its two Ohio facilities. Those improvements include a newly rebuilt No. 9 drop door mixer on the black mixing line; improved, environmentally friendly lighting; and a new dust collector. • New lab testing software and new lab mixer that has increased development capabilities. • A new 55-gallon drum hotbox for better oil processing and improving cycle times and a scale for the forklift truck to check incoming raw materials. The work force of 80 has enjoyed the fruits of Polymerics' success, according to Timmy Samples, as pay raises, a profit-sharing plan, employee recognition program, increased cross-training and overall improved communication has been implemented. For the second straight year, Polymerics will host a rubber compounding course, in conjunction with the ACS Rubber Division. This year's course is May 12-15, as Polymerics continues its push for new opportunities. The challenges, company officials said, will be to meet regulations of REACH—Registration, Evaluation, Authorization and Restriction of Chemicals—that have been implemented in Europe. Officials believe those regulations soon could reach North America. As the plants near 100 percent capacity, Tim Samples said he continues to make plans for a new facility, which he said will be constructed in about three years, somewhere in Northeast Ohio.